WHO: Denzil Porter will be performing along with many other artists including Eric Sosa, Slim Dollars, U Can Call Me L.A., Julian Stephen, Jae Tips and Dom O Briggs to name a few. For a full list of performers, please reference the attached flyer. 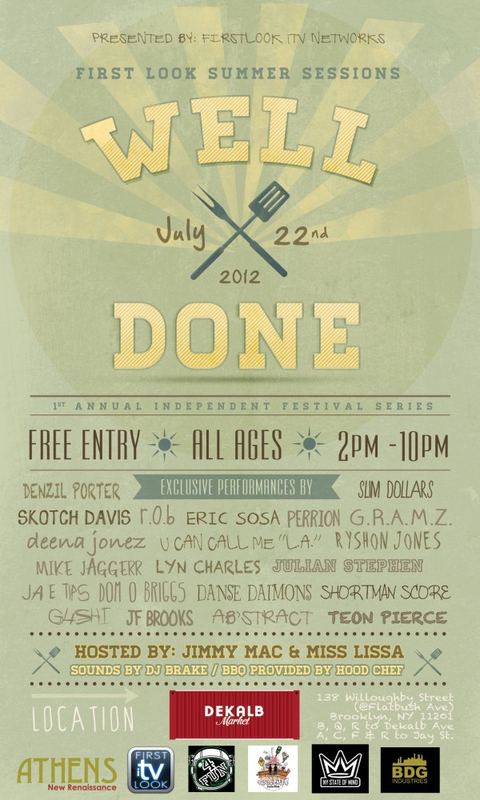 “Well Done” will be hosted by Jimmy Mac and Miss Lissa with music by DJ Brake and BBQ provided by Hood Chef. WHAT: FIRSTLOOK iTV Networks presents FIRST LOOK SUMMER SESSIONS “Well Done” 1st Annual Independent Festival Series. Entry is free and open to all ages. BBQ food will be provided. WHEN: Sunday July 22, 2012. 2PM-10PM. Denzil Porter will hit the stage at 5:45 PM. CONTACT: For more information please visit www.FIRSTLOOKITV.com. For media inquiries please contact Jeunesse Yvonne via phone or email at 917-596-6174 or JeunesseYvonne@gmail.com. For all other inquiries, please contact Denzil Porter’s manager, Mandell Conway at 347-835-1871 or MannyForbes@gmail.com. For more information on Denzil Porter please visit www.DenzilPorter.com.